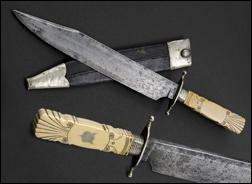 Click here for Summary of State and U.S. Ivory and Mammoth Ivory bans with regards to knives. Updated July 1, 2018: On June 6 the U.S. Fish and Wildlife Service (FWS), acting in furtherance of an executive order by President Obama, published its final rule concerning the Special Rule on African Elephants, commonly referred to as the “Federal Ivory Ban.” The new rule goes into effect July 6. Knife Rights would like to thank our friend Rob Mitchell of the Elephant Protection Association for his insight in compiling the following summary. The Final Rule is designed to implement their goal of a “Near-Total Elephant Ivory Ban” as stated in the FWS press release that accompanied publication of the rule. It is worth noting that the final rule is a far cry from the original proposals back in 2012 that had virtually no exceptions (see below). The delay in bringing forth the final rule and the changes for the better are the result of significant pushback by Knife Rights, Elephant Protection Association, National Rifle Association, Safari Club International and a number of musician’s and music organizations and ivory and antique collector and dealer organizations. Without that effort, you can be sure that the final rule would have come out much sooner and been much, much more restrictive than it ended up being, albeit that it is plenty restrictive as it is. The new rule covers “interstate commerce” in only elephant ivory and not fossil ivory (see below an explanation of why interstate commerce covers much more than you might expect). It includes two exceptions to the near-total ban, both of which will have an adverse effect on trade in ivory handled and decorated knives. The de minimis exception criteria are entirely arbitrary and have no basis in anything rational other than being a means to provide an allowance for this Administration’s favored groups, primarily musicians and symphonies, as well as an attempt to fend off politically powerful groups such as NRA, while still pandering to the radical animal rights organizations. Since little, if any, of the ivory imported “pre-ban” (pre-1990) has any documentation, because none was required, this is potentially a very problematic issue. Other means of documenting age will be critical. 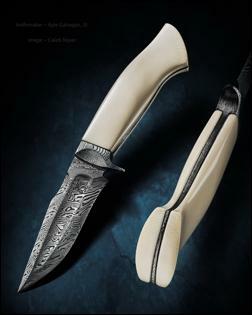 Post-ban, many purveyors of pre-ban raw ivory did keep records that provided provenance, but many knifemakers failed to pass this along to purchasers. Even post-ban ivory may not have been transferred to knifemakers or others with adequate CITES documentation. FWS says the 200 grams comes from their determination that this would encompass most ivory piano keyboards. 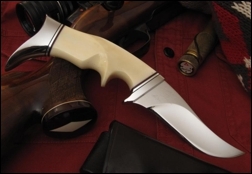 The vast majority of ivory-handled knives will meet this criterion including virtually all folders, BUT some larger fixed blade knives may not. If in doubt, you will have to calculate the volume of ivory as best you can and then calculate the weight. Ivory weighs approximately 30 grams per cubic inch, so 200 grams equals approximately 6.67 cubic inches of ivory (0.25 x 2 x 13.34 inches, 0.5 x 2 x 6.67 inches, 1 x 1 x 6.67 inches, for example). The result would be subject to a review in any FWS enforcement, so you’ll need to document how you accurately came to your conclusion. Clearly, some of these criteria are not necessarily readily ascertained or documented, particularly “vii.” However, in any enforcement action all available information may be used, including email, forum posts and the like. It is difficult not to leave a documentation trail of some sort as to when any recently completed knife was made. On the other side of the coin, a knife about which there is already an online post, email, bill of sale or money trail or which was delivered with some proof of that transfer from before July 6, 2016, would readily meet the “vii” criteria. Absent that, it becomes difficult to prove, and the onus is on you to prove legality (see below). FWS refused to create any “safe harbors” or binding criteria that a seller could rely upon to be certain their documentation was adequate for an item to qualify as an antique or under the de minimis exception. Instead, it is totally up to the discretion of FWS enforcement personnel whether proof or documentation in any given case is sufficient to prove whether an item is an antique or meets the de minimis exception. FWS said that more guidance would be forthcoming, which typically means that after enough issues arise in seizures and prosecutions, they will use their dispositions to provide further clarification of what they can get away with. They may also issue additional guidelines via email answers to specific questions, but unless it is a published opinion by the Chief Counsel of the Interior Department, these are not legally binding. In an exchange of emails that was shared recently, it appears that FWS intends to allow service providers, such as scrimshandlers, to continue their craft on ivory items. Their explanation is that this is a service, not a sale or trade in the item. Two issues arise. The first is that this information and explanation is not legally binding. Relying upon it provides a degree of defense, but just as IRS advice cannot actually be relied upon in an enforcement action, it has no actual legal standing. Second, it isn’t yet clear at time of writing if an item scrimed after July 6, 2016 is eligible or ineligible for sale or trade thereafter, assuming it meets the other five criteria. Then there’s also the issue that the cost of the scrimshaw may push it over the 50% value limit. Despite FWS assurances that they really only intend to enforce the law as “interstate commerce” is traditionally understood, over state lines, it is also important to understand that the term “interstate commerce” is a legal term open to an exceptionally broad interpretation as a result of numerous precedent-setting court rulings. In today’s world, the vast majority of commercial transactions have an interstate connection based on these precedents, even if not sold over state lines. As examples, advertising of any sort, including a mere posting in an internet forum or on Facebook, even if not public, or any other promotion or offer to sell, regardless of medium, could implicate interstate commerce. Unfortunately, it really doesn’t matter what assurances that FWS has made regarding their intent with regards to enforcement of “interstate commerce.” They are not legally binding. Even if those making such pronouncements mean what they say, a change in administration, or even in FWS leadership, could change that overnight to the more all-encompassing legal definition. Also, it doesn’t prevent some lower level FWS agent from seizing items and then seeing how things sort themselves out afterwards. Traveling to another state to sell is, without any doubt, interstate commerce. FWS has indicated that those wanting to offer up ivory for sale only within a state’s borders should have a clear statement with the item that the seller will not sell or trade across state lines. Even if you sell in the state in which you live, out-of-state customers or alleged “straw man” deals would likely violate the law. Moreover, many such sales involve telephone conversations or emails that could make them subject to being “interstate commerce.” There have already been prosecutions under existing law for such transactions. However, it’s a Catch 22 that even if your ivory does not meet the antique or de minimis exceptions, and therefore has no monetary value whatsoever in interstate commerce, precedent suggests that the IRS will estimate its value for estate purposes as if it could actually be sold or based on its in-state value, or black market value. In such a case you would not be able to sell it to pay estate taxes on the items except within the state (if legal and not subject to a wider interpretation of “interstate commerce”). Some armchair lawyers have seized upon this “giving away” allowance as a means to work their way around the restrictions in the rule, claiming that they would separate the ivory from the rest of the item for sale and just give the ivory portion to the new owner of the item at no cost. Anyone who thinks they can get away with that sort of bogus scheme is likely to be in for a painful and costly surprise courtesy of the Feds. As for how enforcement manifests itself, there’s been no surge in enforcement by FWS as of July 1, 2018. How all this eventually falls out will be largely a product of how far FWS decides to push the issues regarding the various criteria. The criteria are specific, but subject to interpretation and individual enforcement variation, particularly with regards to documentation. With a change in the Administration, it appears that this is not a high priority except in egregious importation cases. That certainly doesn’t mean that some FWS officer somewhere may not decide to enforce the law. Knife Rights has opposed this federal rule and state bans on ivory and fossil ivory for the simple reason that they have a very significant adverse economic impact on millions of Americans, including our members, knife collectors, knifemakers and artisans, with absolutely no positive impact on the alleged reason for the bans, poaching of elephants in Africa. Never once have proponents of theses bans been able to provide any rational direct connection between these bans on ivory that’s been legally here in the U.S. for decades and the poaching in Africa occurring today.The FWS and proponents of the bans have lied since day one about the size of the illegal elephant ivory market in the U.S. which is utterly insignificant compared to China’s estimated 95% or greater share, and inconsequential compared to all other countries as well. The U.S. trade in illegal ivory was already essentially the lowest in the world, almost too minimal to be measured, before this ivory ban campaign began. We support the numerous efforts in Congress to address the issue, including the African Elephant Conservation and Legal Ivory Possession Act which would end the FWS’s unilateral moratorium on the trade in lawfully owned ivory, including ivory-handled and decorated knives, while also strengthening measures to stop elephant poaching in Africa and punishing countries that smuggle illicit ivory, like China.In other words, actually addressing the issue of elephant poaching and doing something practical and effective to stop it, unlike this ban which does nothing but hurt honest Americans.